Earlier this week I won a copy of Madden 19 in a Twitter contest. Playing with the Cleveland Browns was one of the bigger things I looked forward to. You might ask why I’m so excited to play with a team rated at 74 overall and the 28th best team in the game. Two words, Baker Mayfield. The Cleveland Browns have never had a highly rated quarterback in the history of Madden or even one that was fun to play with. Baker Mayfield is an electric player to use in Madden and has slowly become a fan favorite with his play and demeanor during training camp. Mayfield has refused to accept his role as a backup and he continues to fight for the starting job. One week through the preseason and it appears the hype train for Baker Mayfield to be a starter, is revving up. 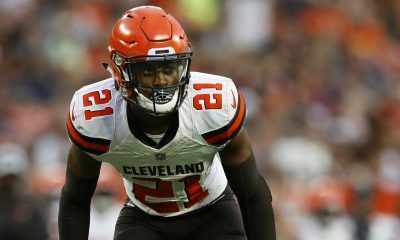 Cleveland has done this before, it didn’t turn out the way we wanted and the guy ended up in the CFL. For some fans, Baker Mayfield starting all 16 games would be a dream come true. 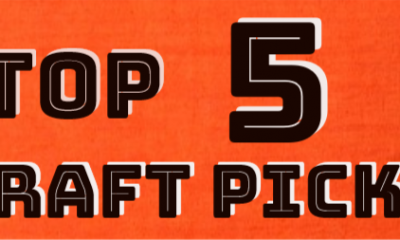 However, the possibility of Mayfield playing this season would rely on Tyrod Taylor either getting hurt or playing the Browns into a winless record. But with the power of Madden 19, I make the rules and in this world, Baker Mayfield starts for the Cleveland Browns. For this article, we will be simulating an entire season with Baker Mayfield as the starting quarterback. As you know, I wrote an article earlier this week where I did the same thing but with Tyrod Taylor. In this article we will break it down by showing the final overall schedule for the team, unfortunately, you aren’t able to take a screenshot of the final week of the season. The next topic of discussion will be a breakdown of each winning week. This section will contain a screenshot of the quarterback’s passing log. Not gonna lie, when I saw Cleveland lose their first four games, I got nervous. But Mayfield turned the season around in a hurry. Mayfield steered the ship to success and finished with a better record than Tyrod Taylor. With a 7-9 record, Cleveland fans had something to cheer about. 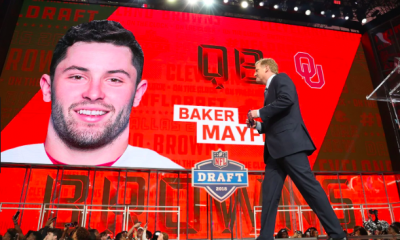 In the games that the Browns won, Mayfield shined. When I simulated with Tyrod Taylor as the quarterback, you saw that Taylor was almost never the sole reason for a Browns’ victory. One of the highlights during a loss was in Week 3 when Jarvis Landry won AFC Offensive Player of the Week when he had nine catches for 149 yards. The most impressive thing of Landry’s week three game was his three touchdowns. If the team hadn’t struggled out the gate, they seriously could have contended for a playoff birth. The Atlanta game was an absolute surprise for me. I figured they’d get destroyed as they did against the higher competition during the simulation. While simulating it seemed like the games they were losing, were super close. In five of their nine losses, the final deficit was seven points or lower. This is a familiar sight with Cleveland fans as the real-life Cleveland Browns lost six games by a score of seven or less in the 2017 season. Overall, the simulation was a success in my eyes and they performed slightly above what I expected. Before I started the simulations I figured that Mayfield would outperform Taylor, but I never expected him to blow the veteran out of the water. It took a while but Mayfield found his groove. I was utterly surprised at how slow of a start they had as a team. Cleveland blew chances in back to back weeks losing to the New York Jets by two points and the Oakland Raiders by only four points. Mayfield put up numbers in the losses, but he really shined in this win. Passing for 293 yards and two touchdowns, he set the tone for Cleveland. Mayfield helped push Cleveland to the finish line and at the official “start” of their season. Even though they finally broke through the wall, it wasn’t very easy to be confident about the possibility of an above .500 season. The Browns’ schedule featured a handful of tests coming up and although Mayfield and co. finally captured their first win, they still had a lot of work ahead. Back to back! 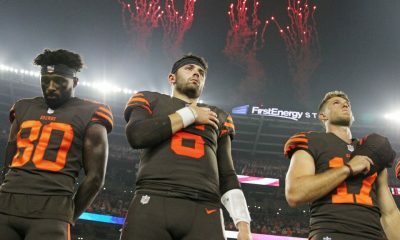 the Mayfield magic has picked up steam and the Browns are starting to look legit. Now while many media members tote the Chargers to be a good team next season, both Taylor and Mayfield beat the Chargers. Mayfield torched the Los Angeles secondary this week and he built off what was an above average previous week. Mayfield surpassed 300 yards for the first time in a win and he posted a 104.6 passer rating. After Taylor won his matchup with the Chargers, I wasn’t as surprised to see Mayfield squeak out a win at home against the LA team. Their next matchup would be against a team that utterly destroyed Cleveland with Taylor as the starter. I was somewhat worried and while I didn’t expect Cleveland to churn out a three-game winning streak, I had faith in Mayfield. A three-game winning streak and AFC Offensive Player of the Week honors. Mayfield absolutely killed it during his week seven matchup against Tampa Bay. For the first time this season, Mayfield scorched a defense for four touchdowns. Mayfield didn’t throw for over 300 yards, but he was able to find the end zone four times. The Oklahoma product accounted for 28 of the 35 points for Cleveland and he once again showed that he’s the boss. During this simulation, I learned a lot. 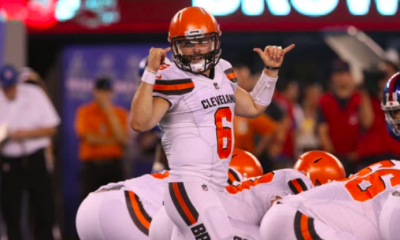 Mayfield would take over games, unlike Taylor who would coast to victories off low scoring affairs with teams and high rushing games for Duke Johnson Jr. 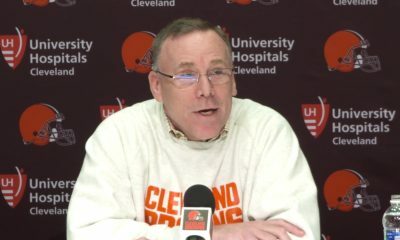 When the Browns were able to rattle off their third straight win, I started to wonder if they were going to be able to salvage their season and make it to .500. The only problem for the Browns was that they traveled to Pittsburgh for Week 8. Would Mayfield be able to win in Pittsburgh for the first time in his career? We would find out soon enough. Mayfield and the Browns finally fell back down to earth. Cleveland struggled against the Steelers once again and dropped their second game of the season against Pittsburgh. The following week they were dismantled by Patrick Mahomes and the Chiefs. Baker Mayfield and the Browns entered week 10 with a 3-6 record and the thought of a playoff spot was basically out of mind. I started to wonder what their record would be if they had not started out so slow. Mayfield passed for below 200 yards for the first time this season and he contributed seven points of his own. The special teams reigned supreme this game however as they returned two kickoffs for touchdowns. This was the first time that Mayfield wasn’t the reason for a Browns victory. This week, however, Mayfield lost Mychal Kendricks for the rest of the season. This was interesting as the only catastrophic injury suffered for the Browns during the Taylor simulation was Kendricks as well. Week 12 was an interesting week. Mayfield was sacked during the first play of the game and he suffered a sprained right wrist. The computer opted to bench Mayfield and play Drew Stanton instead. Before the season started, I made sure in the event of a Mayfield injury that Taylor would not be the one to come in. Stanton performed as expected and the Browns turned to the running game for the remainder of the game. 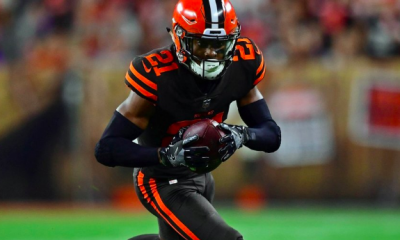 Duke Johnson rushed for 87 yards and the Browns were able to squeak out their first win of the season against the Bengals. At the home screen of Franchise Mode, I was met with the option to have Mayfield practice the next week and I clicked yes. Coming off an injury, Mayfield faced a problem. He would be going up against one of the up-and-coming teams, the Houston Texans. In Week 14, Mayfield faced off against one of the three only rookies to pass for over 4,000 yards in a season. Cam Newton and Baker Mayfield would be an interesting matchup to watch, but the possibility of seeing it this season are slim. Fresh off his injury, Mayfield pushed himself and played through a sprained right wrist. Throwing for 263 yards and two touchdowns. Mayfield showed his injury was in the past and he was ready for the home stretch of the season. Cleveland was able to bring their record to 6-7 and with the off-chance of winning out, fight for a playoff birth. There’s a certain point in a season for teams that finish on the fringe of the playoffs and Week 14 is usually where it happens. If the team is going to make the playoffs, they usually win two out of the last three games of the season and punch their ticket to the playoffs. The other way the season ends is that they lose out and miss out on January football. Their first test after this week was against the Denver Broncos who were surprising the world and fighting for a divisional crown. I had little to no faith that Cleveland would pull out a road win this late in the season. 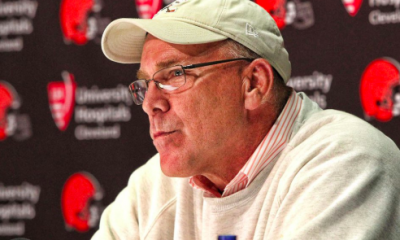 When Week 16 rolled around, the outlook wasn’t too hot for Cleveland. But Mayfield came out punching right away and posted his greatest performance of his rookie campaign. His week 16 barrage against the Bengals earned him his second Player of the Week honors. Throwing for 374 yards and four touchdowns, Mayfield showed the league that Cleveland wouldn’t go down quietly. Winning his seventh game of the season, in his rookie season don’t you forget, is impressive. 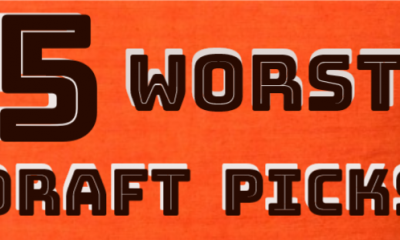 If the Browns were able to win seven games in one season, fans would go absolutely insane. During this simulation, I tried to figure out how the real world reaction would be to these games. 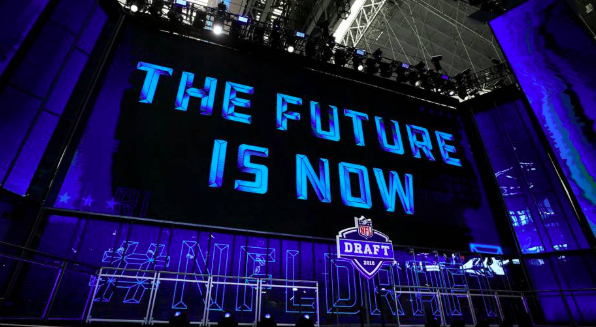 It’s hard to try and realistically imagine a rookie quarterback showing that he’s the franchise piece Cleveland’s been missing out on. Fans would be begging for Mayfield’s face to be on the mural downtown. Looking back on a monstrous season for Mayfield was fun to do. Mayfield finished the season with 4,213 yards, fourth-best in the league. Baker threw 30 touchdowns while only turning the ball over 10 times in the air. Mayfield’s favorite target was Jarvis Landry who finished with 1,128 yards receiving and 11 touchdowns. Josh Gordon finished with 989 yards and three touchdowns. David Njoku had a breakout year was a top-10 tight end in the league. While Mayfield would never play the whole season, it was fun to see how it might pan out if he did. 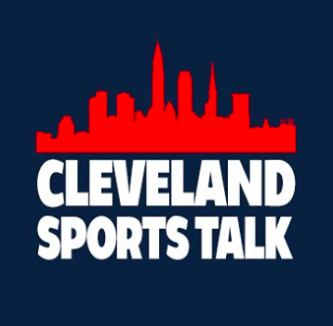 Thanks for reading and go Browns!